Word on the street is that 1 Hotel South Beach is being marketed for sale, and there’s potential it could set a new record for the most expensive hotel deal in Miami. The current record holder is the Ritz-Carlton Key Biscayne, which sold last year for $325 million. But if 1 Hotel sells for $1 million a key, which is a very real possibility, the 426-key hotel would knock off the Ritz. 1 Hotel is a LEED-certified hotel and condo development that was a joint venture between Barry Sternlicht’s Starwood Capital Group and LeFrak. It is located at 2341 Collins Avenue, replacing the former Gansevoort Hotel, which also operated as the Perry South Beach. “That’s obviously a very iconic property in a great location,” Paul Weimer, a vice president of CBRE Hotels recently told The Real Deal. He also added that the hotel market is strong in Miami, but it’s currently weaker on the operating side. Industry experts agree that a deal of this size will likely be closed by a foreign buyer, such as a sovereign wealth fund, or a large institutional investor. Similar sales have been recorded recently, like the Viceroy Miami, which recently sold to Al Rayyan Tourism Investment Company, a Qatari investor. CEO of Hilton Wordwide, Christopher Nassetta, spoke of foreign investment in U.S. hotels just last week at the NYU Hospitality Industry Investment Conference. Other recent, high-priced hotel sales in South Florida include the Miami Beach Edition hotel for $230 million, the Westin Diplomat Resort & Spa in Hollywood for $460 million, and the James Royal Palm in Miami Beach for $278 million. The South Beach hotel is the first of Sternlicht’s 1 Hotels brand to open. His other properties include 1 Hotel in NYC’s Central Park and 1 Hotel Brooklyn Bridge. 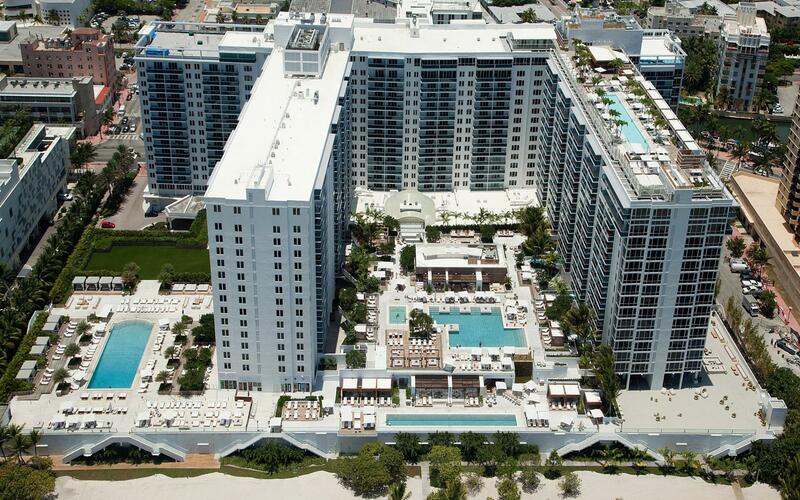 Amenities at 1 Hotel South Beach include four outdoor swimming pools, 57 cabanas and daybeds, an 18,000-square-foot gym and spa, and three Tom Colicchio-branded restaurants. For more information about available properties in and around Miami, contact Oceanica Real Estate at (786) 270-1743 or info@oceanicarealestate.com.